PHILADELPHIA – The morning sun broke through the clouds, illuminating an exquisite glass font, communion vessels, and the handcrafted table on which they rest. 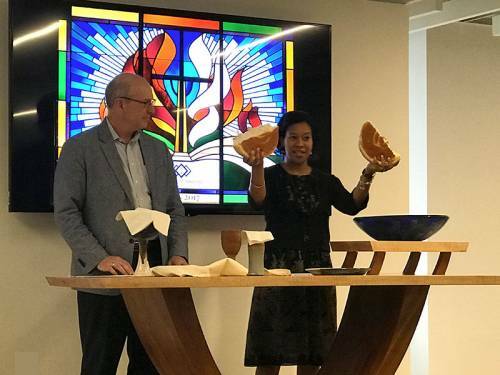 The Board of Pensions of the Presbyterian Church (U.S.A.) dedicated these beautiful liturgical furnishings, along with a pulpit, in a worship service on Sept. 26. The furnishings are a reminder that the Board of Pensions is Church — that for more than 300 years the Board and its predecessors have cared for Presbyterian ministers and their families. “This is holy work,” said the Rev. Frank Clark Spencer, President of the Board. The Rev. Dr. Erich Thompson, a Presbyterian minister-woodworker, designed and built the maple and mahogany communion table and pulpit. His work includes chancel furniture at Montreat Conference Center, Pittsburgh Theological Seminary, and a number of PC(USA) churches across the United States. The baptismal font was created by Kathleen Ash of Studio K Glass, in Austin, Texas. The communion table and pulpit’s design suggests a ship’s hull, an ancient Christian symbol of protection and salvation. The Rev. Dr. José Irizarry, the Board’s Vice President, Education, planned the dedication service, and the Rev. 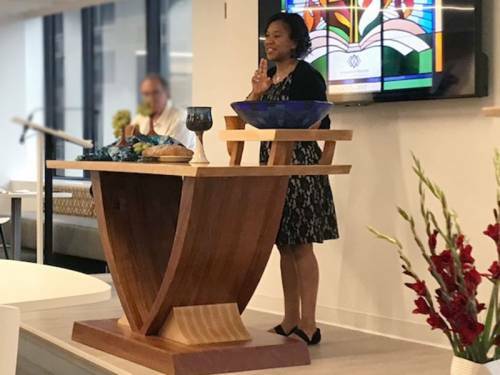 Ayana Teter, Associate Church Consultant, delivered the reflection in Town Hall, the centerpiece of the Board’s newly renovated offices. The multifunctional space is large enough for the entire staff to gather together. Employees share lunch and hold small meetings in the space, and it is used for prayer and worship services and other significant gatherings. The open design of Town Hall extends a sense of spaciousness and welcome. The seating area is encircled by multicolored glass panels reminiscent of stained glass — a nod to the stained glass window installed in the Board’s reception area in 2017 to commemorate 300 years of serving those who serve the Church. The communion table and vessels, font, and pulpit also help inspire Board staff as they go about their work. “These are the symbols that we set before us to remind us that God is with us, that we have been invited into a blessed future, and that we can be a blessing to the families in our community — this little tribe we call the PC(USA),” said Rev. Teter. One of six PC(USA) agencies, the Board of Pensions provides benefits, assistance, and education for ministers, employees of the Church and PC(USA)-affiliated employers, and their families. The 190 people the Board employs reflect the diversity of the Philadelphia region, including in their religious beliefs. The Board holds monthly prayer services in Town Hall. They are led by staff from a spectrum of faith traditions, and participation is voluntary. Many employees welcome the opportunity to support their colleagues’ journeys by attending these services. Exhibiting such respect and caring is essential to the Board’s way of life, both as an employer and as an agency of the Church. And its new liturgical furnishings are a reminder to all Board employees of God’s redeeming love — and of God’s call to show that love to all, near and far.